Zhengzhou CamelWay Machinery manufacture produces tower cranes, construction elevators, concrete mixing stations, JS concrete mixers, concrete batching machines, stabilized soil mixing stations, wheel loaders, concrete transport tanks, JZC concrete mixers and other construction machinery. The company has an extensive user base in the country, enjoying a high popularity. Some products are exported to Vietnam, Laos, Kazakhstan, Mongolia, Russia, Cuba, Brazil and other countries, being highly praised by foreign friends. 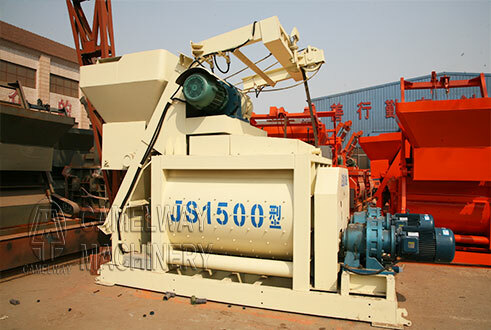 Then we will introduce js1500 concrete mixer to you. Js 1500 type concrete mixer diacharge capacity is 1500 litre; The total power of js1500 mixer is 65.5kw; The mixing speed is 23.5 r/min; The weight of concrete mixer is 11.2 ton.